Oh, how lovely to have a quieter week - must say I am fluffing about and doing a lot of time-wasting. A glorious day here again today - we are so lucky, we've had the highest April rainfall on record and the rain usually falls at night leaving us with beautiful, cool, sunny days. Now that Step 3 of my Blueberry Crush is complete, I am concentrating on my handwork, a hexagon quilt I started many years ago. 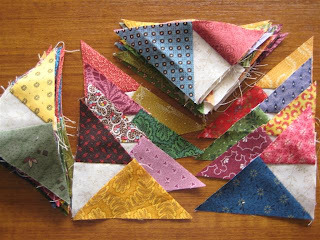 It is all English Paper Pieced and I have used antique reproduction or vintage-type fabrics. 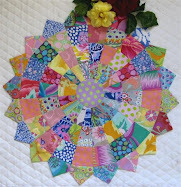 I would love to start an applique quilt I intend doing, but I am on a mission with this one, so must keep at it. I can't sit down much during the day, so may machine piece a cot quilt at the same time. I have just finished Step 3 in the Mystery Quilt Orange Crush. My quilt will be called Blueberry Crush as my main colour will be blue. This step has been so enjoyable because we have only 44 units to do and also we are stepping at a slower pace. I have fewer commitments outside the home this week, so will spend some precious time sewing, just great, it doesn't happen often! 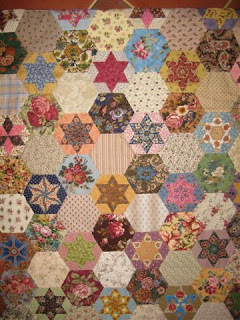 Our state quilt show, QuiltWest, will be held 21 - 25 May and as I am on the committee there are busy times ahead for me. For 17 years (1977 - 1994) I lived in the small bauxite mining town of Nhulunbuy, Gove (population approx 3,000) in the Northern Territory, Australia. I had a wonderful career and life there, with many great friends and a great social life that we made for ourselves. However, there was absolutely nothing available in the way of shops for crafts , so we bought our supplies when we flew out on leave. 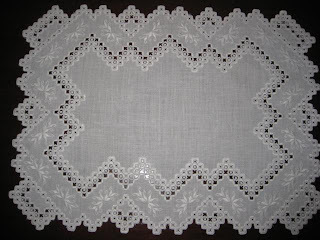 I was a self-taught hardanger enthusiast for a few months and treasure this piece I did. I really enjoy hardanger, but there are so many exciting quilts I want to make that hardanger is on the back-burner 'til I'm an OLD lady, LOL! I have finished Step 2 of OC and have a little trimming to do, so shall post soon. I did a trial run on Step 3 today and it will be lovely to have a small number of units to do in this step. Yesterday we had a great day sewing at my place. It is just lovely to have such good friends and such good times! See the photo on the left of Julia and Pat - just lovely, isn't it? Julia doesn't have a big photo of herself on her blog, so I am twisting her arm to put this one onto her blog also. That is Julia on the left. I would love to OC to finish split 4-patches today, but 4yr old twin grandchildren have to have their flu shots at 10, then Mum has the opthamologist at 2:30, so I don't think there will be much sewing done. Oopsy. lost my signature again - best wishes to all - Lurline. You can teach old dogs new tricks! I did two of Bonnie's first Mystery Quilt using the traditional method of cutting half-square triangles. 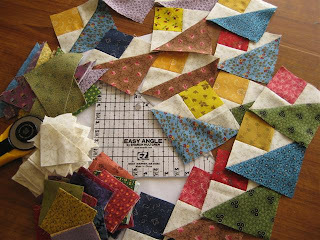 I was feeling quite daunted about doing 142 of these tiny little 3" blocks for second Mystery Quilt, Orange Crush. Julia loaned me her Easy Angle Ruler and it is just wonderful - I have already done 100 since 1pm yesterday - did sew into the night though, which I rarely do. Poor Mum must be feeling neglected! I'll be tracking a ruler down tomorrow. Off to bath puppies, now, then shop, then cook for the sewing girls coming here on Tuesday. 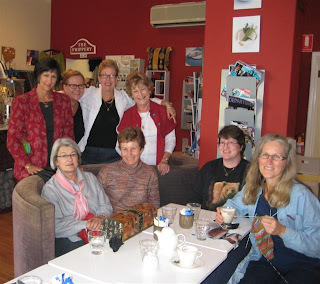 Yesterday we all had a great day, meeting for lunch at a wool/coffee shop in Wembley. It was really lovely and very inspiring. Though I promised myself and everyone else I would NOT buy anything, I did! Just wool for a simple little pram throw - not for any new baby that I know of , maybe just my Glory Box - I tend to still be enchanted by baby things! I am feeling a little daunted at Step 2 of Orange Crush - will have a little play tomorrow and see what I think. Thought I would post a photo of one of the pretty dollies I used to make pre-quilting days. I really loved those days and then when I started quilting, friends said "that's it - there will be no doll-making, now"! I was aghast at such comments, but guess what - it is over 9 years since I made dolls. 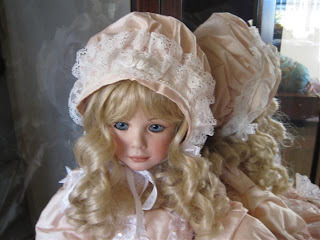 I mainly made antique reproduction dolls and loved the history of it all. Since we moved to Western Australia some of my dollies have never been unpacked. At least I have been sitting and chatting with my 89 year old Mum, who lives with me - of course, I have been hand stitching also, which I rarely do during the day. Nice to relax for a change though. I feel I should post again to keep in practice, and I do have a little time now, but it will be a busy week ahead. I have just finished tidying my sewing room - it became a bit chaotic going through fabrics for my Blueberry Crush. I visited Houston last November with friends for the International Quilt Show and of course we shopped 'til we dropped - so have just put some fat quarters in the brown highboy you can see on l/hand side of the photo. The carpet bag was full of fabrics I bought in the USA. I think I bought over 300 F/Q's and about 30 yards. Sounds a lot to the US girls, but fabric there is so much cheaper than it is here. 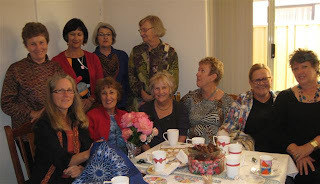 It was so funny - we were a group of 7 plus 1 (7 girls and 1 husband) - we all had to scuttle off to post offices during our 4 weeks over there and send boxes home - we would have had to pay a LOT of excess, otherwise. Yardage has been hidden in plastic boxes you can't see. Thought I would do a tidy-up as Bonnie may post Step 2 of Orange Crush tomorrow - a bit exciting waiting for it to happen, isn't it? Even though I probably won't get a chance to work on it until Wednesday, at least it will be exciting to have another step to the mystery revealed. Many thanks to people who have viewed by blog - such lovely way to keep in touch! Oopsy! Have lost my signature again - best wishes and happy sewing to all - Lurline. Wow - am I ever having problems with this new printer - however, I am getting there, SLOWLY but surely! Thought I would tell you about what is perhaps the favourite quilt I have made. The above was my own design after seeing a photo taken at the Michigan University Museum. 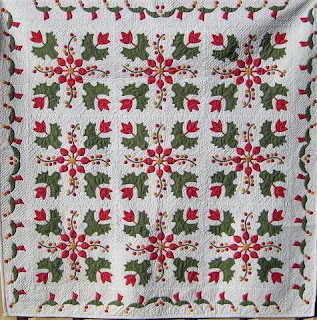 I think the original would have been made in the 1840's - that is when the red and green quilts became very popular. 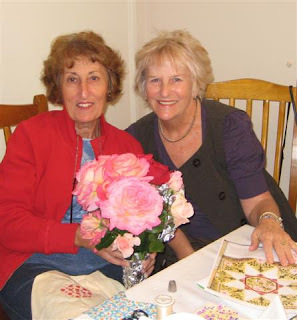 It features my two loves in quilting, applique and hand-quilting. This quilt was made in 2002 while I was living in Carseldine, Brisbane. In those days I had a lot more time to concentrate on applique, and I keep saying to myself I must applique again soon. I still do quite a bit of hand-quilting and find it very therapeutic - just lovely to go off into one's own little world! I was very fortunate to win blue ribbons in both Queensland's and Western Australia's exhibitions with this quilt. Oh, oh - now I have lost my signature. Oh, well, a little more progress today with Julia's help once again. 'Bye for now - Lurline. 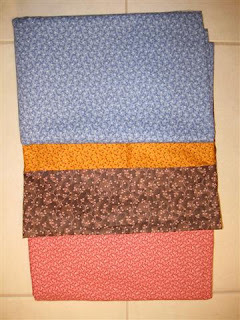 Blueberry Crush Fabrics (Not Orange Crush)! I will be VERY happy if this works! Above are the fabrics I've chosen to use in making Bonnie Hunter's Mystery Quilt 2. I made her first Mystery Quilt, Carolina Crossroads and so enjoyed it I actually made two of them. Bonnie has named her quilt Orange Crush, but I have decided to use blue as my feature fabric, with the brown and pink as secondary fabrics and the cheddar as my accent. All fabrics will be antique reproductions and I have had so much fun re-discovering fabrics in my stash for the scrappy 4-Patches. It will be quite a bright quilt - just shows what beautiful colours were used in the 1800's. Aren't we so lucky we have wonderful people who have done the researching for us? I made 70 x 4-patches today - had hoped to complete the 150 - never mind, I will try to get back to the machine again tomorrow. As I'm sure it is for most of us, I've had very busy days. Dearly love my family, but they do seem to get in the way at times. I must mention what a great help Julia of Camille's Place has been to me - bosom-buddie's we are! 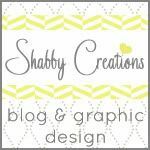 SLOWLY developing my Blog - have so much to learn and unfortunately am on a very slow learning curve. Even if I manage to post this message it is a tiny little step.